On the popularity metal stairs go after the wooden stairs, taking a second place well-deserved . Metal stairs are traditionally used as industrial or exterior, but today more and more. Metallic elements often serve as the basis for wooden or concrete stairs. The result is a combination of stairs, consisting of metal and stone, wood, glass, concrete, in all these combinations of metallic elements reinforce the structure, adding to her resilience and strength. 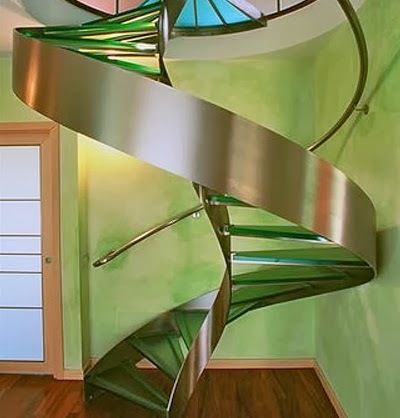 Stairs, wholly or partly made of metal can be any shape - straight and spiral, elliptical and curved. All metal ladders can serve as main and auxiliary means of descent / ascent, can be installed almost anywhere - today enough coating to help protect prone to rusting metal from moisture while giving ironwork attractive. Metal is not easy to handle, but even the standard products of modern metal allows to embody the most fantastic ideas of designers and customers - in combination ladder. Besides metal stairs cheaper wood, because the cost of the metal below the cost of hardwood. few customers agree that their internal staircase was entirely of metal yet , only presenting a hollow sound of footsteps on metal stairs, metal stairs to evoke the cold - "cold metal". Quite another matter, unless the frame is metal stairs, and other elements of a different material - wood, stone or glass. If a wooden staircase creates an aura of classical style, the staircase to the metal frame - light and airy feel of modernity. However, the final product - a metal stairs - will be what it will do, so you need to carefully choose the performers. 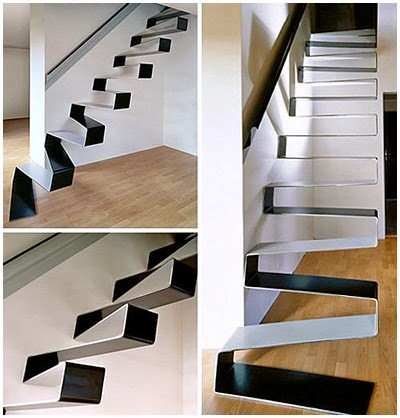 Metal stairs are operated under different conditions - they are external and internal. In the first case, the important strength and high wear resistance, without any design refinements. The internal stairs of metal more demanding, and they should be strong and strictly match the style and have no defects. Elements of internal and external staircases of metal joined by welding, in each case in different ways - by internal stairs welds should not be evident. Say it is impossible? Well, why not - experienced craftsmen are not like that. Even the weld can and should become a design element, combined with the main stair ornament and dissolve in it. Stairs made of metal can be especially made of nonferrous metals and alloys, chrome-plated and forged decorative ornament - a real masterpiece. Until the moment when the customer will enjoy your new acquisition - a metal stairs, it goes through several stages of creation. 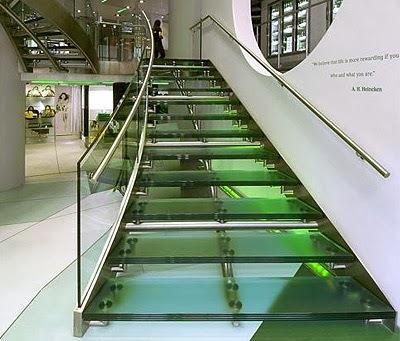 At the first stage designer develops future style stairs, creating sketches and coordinating them with the customer. Next artist takes measurements on site and expects to construct stairs. Calculations are completed - drawings sent to the shop, where all the ladder elements will make , basic and decorative. In the next step ladders installers collected on site. If the room has other repairs (decoration, installation of other equipment), the stairs going to only partially - the basic elements. Last stage - complete assembly of all the elements and as a result of metal ladder ready. Important note - no serious artist would not agree to reduce the strength characteristics of a ladder structure for the sake of design, the main task of stairs - be safe. In the manufacture of metal and combined stairways used almost the entire assortment of metal: steel pipes and sheets, fittings and profiled steel (angles, channels, I-beams). Stringers and the string can be from an I-beam or sill, as well as of angle steel and non-standard profile - box, ramp, double-T-shaped, fitted with brackets. In creating decorative elements used forging and casting, giving the stairs uniqueness. metal stairs to the base of the steel sheet attached ribbed surface or completely coated with a material that reduces the slip to a minimum, there is good tires. Creation of metal stairs - a laborious process. Insufficient attention paid to the structural strength, you need to carefully handle all ladder elements of rust and burrs before painting. All edge parts must be carefully rounded - any imperfection can turn trauma. In a case like the creation of metal ladders professional artist - not an empty phrase.